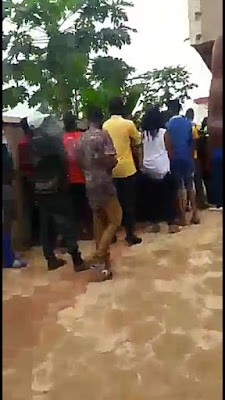 A Student of the Prestigious Nnamdi Azikiwe University Awka, who was always known to mind her business, who always come in and go out of her Lodge at her own discretion has been found dead in her room after four days. The incident occurred within the first week of August 2017 and no one including her neighbors knew of the incident until after 4 days. With the combined effort of the residents in the area, the door was broken down to uncover the misery of her absence and what exactly brought the flies and smell around. Lord have mercy, a lesson for others.